El Dorado Casa Sayulita is a superb, grand villa located just outside downtown in a quiet area. 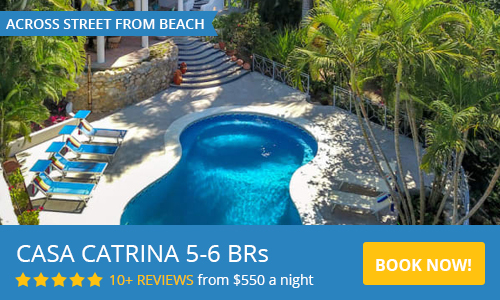 The home is recently built and perfect to spend vacations and holidays in the beautiful town of Sayulita! LIVING/DINING: The first thing our guests will notice as they walk into El Dorado Casa are the large open spaces, and how each room flows from one to the next. It offers a large high ceiling dining area with a lovely view of the pool and the yard as well as a spacious living room with the same pool view, perfect for lounging around without being outside. KITCHEN/BBQ: The home offers a very modern concrete finish and solid wood gourmet kitchen with brand new stainless steel appliances, including a dishwasher for your convenience and a massive center island. The kitchen is fully equipped with everything you could possibly need to accommodate your large group (up to 20 people). The BBQ area is just beside the pool and terrace, underneath the gorgeous palapa. It features a large gas powered grill, an outdoor sink, ample counter space and a second outdoor dining area. POOL AREA/TERRACE: El Dorado's greatest feature is its spacious outdoor entertainment area, its most obvious being the "lagoon-like" pool and slide. On one end is the shallow kiddie pool which is joined, yet separate from the larger pool, and on the opposite end is the elevated jacuzzi. All three are fully heated year round! The terrace features various padded lounge chairs and tables all located near the outdoor bathrooms and showers as well as the homes second living/lounging area. On the edge of the property you will find the perfect gazebo for morning coffee or an afternoon nap. Situated on the same end of the grounds and next to the pool, is a massive backyard space perfect for the kids to run around. BEDROOMS: The home has a total of 6 bedrooms; the master bedroom (king size bed, full bathroom, beautiful views, not to mention the onsuite jacuzzi!) and 3 "onsuites" (each with two full beds, and its own private spacious bathroom) located on the top floor. The fifth bedroom is located on the main floor of the home, as is the NEWLY added sixth bedroom. They each feature a full bathroom, a full-size bed in one and a king size bed in the other; they are perfect for guests who might have a difficult time with the stairs. There's A/C in every bedroom for your convenience, TV and dish satellite, as well as luxury sheets and plenty of pillows. The home comfortably sleeps 18 people, if you are traveling with a larger group we still have options please reach out to us so we can help make your stay more comfortable. INCLUDED AMENITIES: We offer staff cleaning service every day except for Sunday. All the bathroom amenities necessary for your stay, fresh drinking water and plenty of beach chairs, umbrellas, coolers and towels to make your beach day more comfortable. LOCATION: El Dorado Casa in Sayulita is located an easy 10 min walk to town, and 15 min walk to the beach. Its perfectly surrounded by lush jungle vegetation to give the best views of a tranquil vacation property. Noise from the vibrant nightlife in town will never be an issue in this home. EXTRAS: El Dorado has a few "toys" your group would certainly enjoy, such as kayaks and golf cars which are readily available for use at preferential rates for our guests. If you would like a catered dinner for your group, in-house massage or anything of the like we'll gladly set it up. Also, if you are traveling with a baby, we have baby gear for your traveling convenience. Please reach out to us to learn more about our services. Beautiful home - great for large groups! Our family recently stayed at Casa Dorado over the holidays and had an amazing time! The decor was amazing, we felt right at home with all of the Christmas decorations. With a beautiful master suite and a yard that was perfect to relax and enjoy the sun and pool, we all had a great time during our stay. Everyone who helped out during the stay was amazing and went above and beyond to make sure we were well taken care of. Thank you again, Andrea and Monica for such a beautiful home to share with us. The best house to stay in sayulita, very spacious, excellent decoration and very pleasant. All to spend an unforgettable time. La mejor casa para hospedarse en Sayulita, muy espaciosa, excelente decoración y muy agradable. Todo para pasar un rato inolvidable. Amazing place, comfortable, spacious and charming decor. Super equipped and close to the village and the beach, 100 % recommended! Increíble lugar, cómodo, amplio y con una decoración de encanto. Super equipado y cerca del pueblo y la playa, 100% recomendado! A perfect place to relax, enjoy the family, boys and great on the beautiful beach of Sayulita (Surf Beach). In Mexico. Un perfecto lugar para relajarse, disfrutar con la familia, chicos y grandes en la hermosa playa de Sayulita (Surf Beach). en Mexico. We love our yearly trip to El Dorado Casa! Our family's yearly trip to Sayulita takes place at El Dorado! My two young daughters play freely and enjoy the spacious property! We love it! This house is amazing and Monica was extremely hospitable. She helped us arrange golf carts to get to and from town/beach, chef services, taxis to and from the airport, etc. The only thing I wish we had known ahead of time was that the wifi was not working at the house and since the house is right outside the town, cell service was spotty. La casa es hermosa, muy amplia y perfecta para estar en familia. La anfitriona estuvo siempre al tanto de lo que se necesitara y fue muy amable! Perfect for a families, a group of friends, weddings or events! Holidays: Christmas/New Year; Thanksgiving; Spring Break/Semana Santa; Presidents' Day: $1,200 USD per night. CHECK INs / CHECK OUTs: Arrival time at the home is after 3PM, at this time the property will be vacation ready! On the day of your departure, we expect you to have vacated the home by 11AM so we may have enough time to leave the house in spectacular condition for our next guests. Guadalajara native who grew up in Oregon, now a wife and mother of 3.Cross fit enthusiast and chocolate lover!Been vacacioning in Sayulita from birth.Excited to help plan the perfect vacacion with your family and friends!